If you are a gun owner having a safe is a no brainer, depending on where you live it may even be a requirement. The question becomes “what safe do I buy?”. If you only own 1 or 2 guns a small model capable of sliding under the bed or into a drawer may be the answer. Gun owners with a large collection typically select a large floor model, but what if you do not have the room or idea of home decorating that allows 1000 lbs. of steel to sit in your room? The answer is the in-wall safe. In-wall safes are smaller than floor models, yet can be large enough to hold a small collection. Because they are mounted into the mall they take up zero living space. Plus, by adding a picture, mirror or similar wall hanging they can be easily hidden from sight. As with any safe there are some areas of concern, features which must be weighed before making a final selection. Of course you need to consider items such as locking mechanism, ease of access and fire resistance the same as with any safe, but there are also features specific to this design which are equally important. One of the very first issues to consider is size. First, you need to make sure the safe will fit within the walls of your home. Most modern models are designed to fit between your wall’s studs, but if you have an older home this may not hold true. Second, it is important to make sure the wall is deep enough to accommodate the safe. Once installed the safe should sit flush with the wall. Once you know the safe will fit into the wall you need to ensure your firearms will fit into the safe. There are two rules of thumb that most experts recommend when it comes to size of your safe. One, if storing long guns select a safe with an interior height greater than your longest firearm to allow easy removal in a hurry. Two, buy bigger than you currently need, if you have 4 guns buy for 6 etc. In-wall safes by their very design are far more permanent than other models, even free standing designs weighing 100 lbs. or more. One installed they cannot be easily move- either to relocate or maintain. 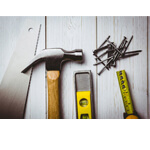 Unless you have a permanent handyman on retainer you will want to select a model that does not require moving to clean, change lock batteries, replace light bulbs etc. 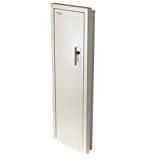 Aside from routine care you will also want a safe which can be installed once and give you years of faithful service without worry you will need to replace it only a few years down the road. It goes without saying that any safe you buy and trust to protect your firearms needs to be strong. When you are depending on a wall safe you hope that its ability to be concealed will keep it safe by keeping it hidden. But what if a burglar finds the safe and has the time to attempt a break in? If this happens it is vital that the design make breaking in a fruitless effort, at least long enough to cause a would be thief to move on. Look for models with a solid box construction, a tight fit to the wall and a door which is reinforced. Each of these features reduces pry points, limits weak points and making potential drilling difficult. In all honesty no safe is capable of defeating every break in attempt, even bank vaults fall victim to expert safe crackers, but the better the safe the hard it is to defeat and the more likely a burglar will look for easier targets. Now, let’s look at some of the models currently available and see how they stack up against our criteria and each other. The Closet Vault provides top of the line security, concealment and access- everything one is looking for in a safe. Plus, they do it in an in-wall design. 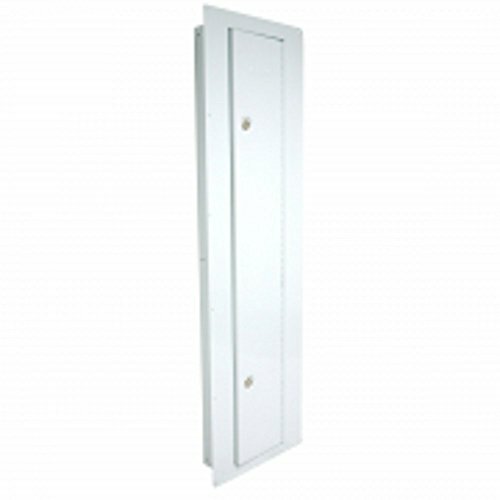 The 14 gauge steel door offers excellent protection against prying, cutting and drilling. The heavy duty, 16 gauge steel, solid weld one piece body offers no seams or connectors which may be attacked. The solid steel rod locking rods protrude deep into the frame at both top and bottom, providing rock solid pry proof security. 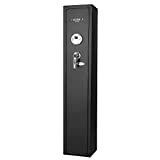 The push button mechanical lock is reliable and fast while also removing your need to rely on batteries or an outside power source and minimizing upkeep. The powder coating finish provide a carefree, attractive finish and the metal interior can be easily wiped down. Plus, each safe comes with a 2 year supply of Cortec corrosion inhibitor. 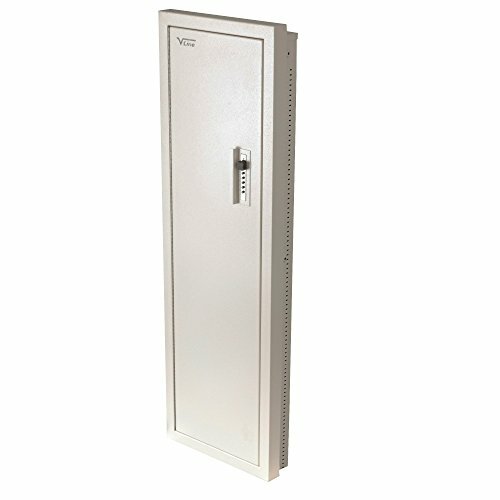 This safe is specifically designed to fit between 16” studs and protrudes less than 2” from the wall surface, providing extra depth without limiting ability to remain hidden. The interior dimensions of 49 ¼”x13”x4 ½” is not only tall enough to accommodate most long guns it is also deep enough to allow handguns to be hung from the door. With the addition of available shelves and pistol hangers, which are easily mounted via predrilled peg holes, you can easily reconfigure the storage options to meet your specific needs. Very solid, heavy duty construction. Extra depth expands storage options and capability. Mechanical push button lock means no batteries, no power source. May be installed into wall or floor. Interior lacks carpeting or other protection for stored items. If you own long guns this safe is one of the best options available for hiding them. The solid welded body is constructed of heavy duty 1.5 mm steel with no screws to pry loose or panels that can be separated. A full piano hinge provides reliability as well as security holding the door top to bottom limiting pry points. The locker key operating system requires no power to operate and duplicate keys are difficult to have made, a handy feature if you have contractors or safe in and out of your home. Finally, the exterior is powder coated to provide an additional level of protection. The cabinet is designed to fit between 16” studs which makes installation easier, depending on your skill level it could even be a DIY project. The front panel overlaps the edges of the side panels which provides both added protection and act as trim covering the edges of the opening. The mounting bolts attach directly to the studs via holes which may only be accessed from inside the cabinet. With interior dimensions of 14”x2 7/8”x56 7/8” this safe may not hold vast collections but it will accommodate even you longest waterfowl shotgun. Available accessories including shelves and hangers allow those with smaller rifles or firearms to reconfigure the interior to allow for storing of magazines, ammunition and other related gear. Easy installation, possible DIY project. Sits flush with wall allowing for easy concealment. Tall enough to permit storage of even hunting rifles or shotguns. Thinner box construction than competitors. Locker key is reliable but not a fast means of access. The Barska Biometric combines craftsmanship and technology to provide a dependable, concealable and easy to access option for storing your firearms. The solid steel, seamless box construction provides just what you are looking for in a safe- the ability to defeat intruders. The dual motorized locking deadbolts not only lock but do so with dependability. With pre-drilled mounting holes, accessible from only inside the cabinet, means once the safe is in place it is there to stay. With interior dimensions of only 13.75×3.5”x18.75” this is not the safe for long gun owners, but is perfect for those looking for a hidden safe place for handguns of all sizes. The between the studs, wall flush design and black powder coated finish means installation is easy and the finished product looks as clean as it is strong. Standard configuration includes two removable shelves, which can rearranged to meet personal preferences. 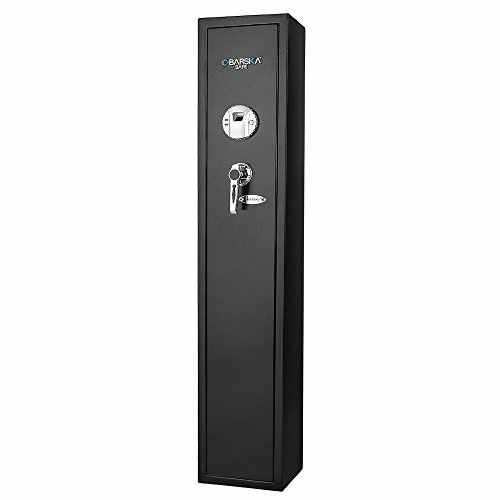 The biometric lock, operated by self-contained battery power source, offers the latest in operating systems. Simply apply your finger, your print is read and the door is unlocked. Speaking of fingerprints the system memory is able to retain 120 individual prints- you and 11 other individuals can records ALL your personal prints for easy , fast access. Of course there is always the possibility the power will fail or the reader will not be able to recognize a print in which case the supplied secondary key lock means you will never need a lock smith(or blow torch). Faster access is almost impossible to find. Dual operating systems means you will always have access. 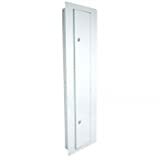 Size and flush mounting means it is easily concealed behind picture, mirror or small furniture. Easy set up especially for electronic system. Beeps when activated, not preferred if trying to access firearms discreetly. Shelves held by only small plastic clips pro to breakin.